DGL provided concept and detailed designs as well as construction phase services for the replacement of the David Root Bridge which carries Stadium Drive over the Ottawa River. As a separate project critical to the Root Bridge construction, DGL served as the civil designer and team lead in a utility relocation project which routed a major steam line across the river on a new utility truss just up river. The utility project was completed on time and under budget allowing the Root Bridge schedule to move forward uninterrupted. The deteriorating existing bridge was replaced with a three-span, prestressed concrete, box beam superstructure on capped pile piers. The capped pile pier substructure provided the lowest impact on the stream environment while also expediting construction of foundations during early spring such that work was completed before the in-stream work restrictions began in mid-April. 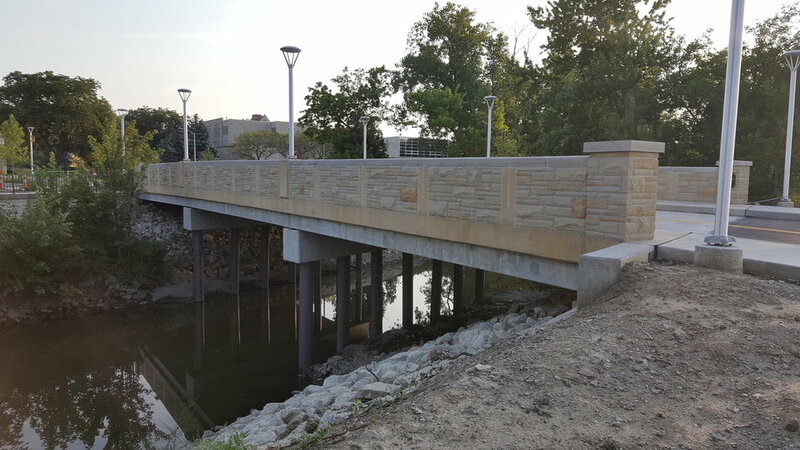 The new bridge incorporates larger, sidewalks and improves the area aesthetics by featuring the classic UT-blend Arriscraft stone work. The project was completed on time with extra budget which allowed for additional improvement of the approach roadway, sidewalks & landscaping.